Quentin Tarantino knows only two forms of cinematic punctuation—scare quotes and exclamation points—and he uses them both nonstop to produce his “irony!” To his detractors, he’s a preening copycat, bombastically frivolous, pedantically vulgar, using the work of older, better filmmakers as his litter box. To his admirers, among whom you may sometimes include me, he’s more like a curiously wired electrical transformer, plugged into a main power source of pop moviemaking. The energy he draws comes from the magnitude of cinema—not so much the dimensions of a big screen (an artifact that is becoming obsolete) as the accumulation of sound and light, part junk pile and part treasure trove, that is the vastness of film history. In Tarantino’s best work—which now includes Django Unchained—he exaggerates social conflicts to the point that movie culture itself seems to be the only common body of reference large enough to encompass them. Imagine, for example, that racism in America is a monumental fact of centuries-long duration. (A plausible thought.) Older narrative techniques, such as the depiction of an exemplary life, often struggle to convey the tremendous scale of this horror, which extends far beyond any one person’s experience; but a film, as Tarantino understands, can express the enormity at will, pulling images of a multitudinous racism out of 1960s spaghetti westerns and ’70s blaxploitation thrillers, Hollywood epics of the silent era and Quentin Tarantino mashups from the recent past. You might say, in an unkind mood, that Tarantino cares more about the thrills these movies can provide than he does the substance of his story—that he calls up the violence that has haunted the lives of black Americans, or European Jews, or Uma Thurman, as a mere excuse for satisfying the audience’s bloodlust. Judged on a film-by-film basis, this accusation might sometimes stick. But if taken as a principle, which would condemn all gory entertainments as suspect, the argument falls apart, for reasons having to do with the same film history that Tarantino plunders and glorifies. Throughout this history, dour moralists have fretted that people may confuse the screen with reality, while cynics have never tired of reminding us that “it’s only a movie.” They’re both wrong. Almost from the start—say from the time of Chaplin’s Kid Auto Races at Venice—audiences have known perfectly well that movies can be a self-referential game. For an equally long period—starting, say, from The Birth of a Nation (a film of keen relevance to the subject at hand)—audiences have liked to feel that they’re not wasting their time at the movies, and so have admired films in which the game seems to be played for life-and-death stakes. Good popular movies can invite us to recognize them as outsize fantasies, largely concerned with themselves, while at the same time touching on something substantial in our lives—which is what Django Unchained is able to do. In several ways, this stepping out of the ordinary is the theme of Django Unchained. Django vengefully escapes being one more piece of chattel; Schultz playfully and profitably exerts his superiority over the mass of crude Americans; and Tarantino once again proves that he can stand above the countless half-forgotten movies from which he borrows. His dramaturgy is more high-handed than theirs (as when he has Schultz reveal to an entire town, with theatrical panache, that he’s a bounty hunter), his direction more exuberant (as you can see in the townspeople’s reaction, with one woman in the background swooning—normal enough for a movie—but another hopping away on a crutch). Partaking in his creator’s nature, Schultz too is a showman of sorts, improvising roles for himself as he goes about collecting bounties and instructing Django, now his apprentice, never to break character. This method of self-definition through playacting certainly distances Schultz from his surroundings, just as it helps remove Tarantino from both run-of-the-mill cinema and base reality. (The date of the action, 1858, is “two years before the Civil War,” according to an introductory title, tipping us off that Django Unchained takes place only in the general vicinity of fact.) But distance is not necessarily the same thing as indifference. I think Schultz means exactly what he says when he purchases Django, sealing the deal in blood and crying out with bitter, anachronistic jocularity, “Sold American!” And Django himself clearly speaks from the heart when he claims his first bounty. Watching as a whip-wielding, Bible-toting overseer staggers forward in disbelief with a bullet from the enslaved man’s gun lodged in his chest, Django tells him evenly, “I like the way you die.” It’s as forthright an utterance as John Brown’s valedictory statement, “The crimes of this guilty land will never be purged away but with blood,” but expressed with grim pleasure—and an anticipation of more to come. Foxx is a witty actor, though you wouldn’t know it from the cold fury of this line reading. Almost until the end of the film, he leaves the humor to Waltz, playing Django as a watchful and deeply determined man—a straight man, you might say, to the joking Schultz. Gradually, the film itself adopts Django’s gravity. In one of its earlier scenes, Django Unchained evokes D.W. Griffith’s notorious night ride of the Ku Klux Klan (a couple of decades too early, but no matter) and then grants itself the leisure to stop, start the sequence over and this time mock the Klansmen as chatty, bickering dolts, one of whom is so unimpressive under his white sheet that he’s played by Jonah Hill. As events progress, though, and Django reveals that his wife (Kerry Washington) was deliberately sold away from him, the two bounty hunters resolve to pause from their moneymaking and try to claim her. This means they have to descend into Mississippi—the name scrolls across the screen in huge, ominous letters—where nothing is all that funny anymore. The role-playing grows more tense—especially for Django, who must now impersonate a black slave trader and so make himself the most hated man in the South. The witticisms grow more leaden in this setting, where they are mouthed principally by Calvin Candie (Leonardo DiCaprio), a blandly murderous plantation owner of the sort who is pleased to think himself cultured (he likes to be addressed as “Monsieur Candie,” though he speaks no French) and by his black overseer Stephen (Samuel L. Jackson, made up like Uncle Ben and shouting modern-day ghetto invective), who identifies so thoroughly with his white master that he hovers behind Candie’s shoulder at the dinner table, seconding his threats and encouraging them to be redoubled. The tone darkens, and so does the palette, as Django Unchained stops being a road movie and gets locked into interiors, and the dominant narrative effect shifts from wide-open surprise to claustrophobic suspense. These are the outward signs that accompany Tarantino’s reliable old trick of introducing the protagonists to their evil doubles. Schultz, who is a sophisticated man and a classic liberal (he intends to own Django for a while, he explains, because he might as well take advantage of the circumstances, but he promises to feel guilty about it), sees himself grotesquely reflected in Candie, who buys and discards people without a qualm and hollowly pretends to refinement. In Stephen, Django faces an even more troubling reflection. The two men are genuinely alike in being tough, wily and unbowed; but even though Django is in full rebellion against slavery, he appears to the world (and temporarily to himself) to be as thorough a collaborator as Stephen. No wonder the situation feels explosive. Django and Schultz stare into their own worst possibilities as they mimic these two men, who may boast of standing out from the ordinary but are, at heart, horribly common. I could hardly have enjoyed the contest more. My only reservation about Django Unchained is that the explosion, when it comes, feels only as satisfying as it has to be—perhaps because the character who exceeds requirements, Schultz, has by this time dropped out of the picture. He’s had to; narrative logic demands that Django endure the final trial alone, and yet Schultz’s departure reveals how deeply, and strangely, Django Unchained has been his movie. Played by the same actor who dominated Tarantino’s Inglourious Basterds in the role of a Jew-hunting Nazi officer, Schultz is in effect the good German, returned to redeem the impression left by the bad. He is chivalrous toward Django and his wife, attributing this virtue to the inspiration of the Nibelungen Saga. He also rises to a full-throated defense of German culture when a member of the Candie household provides her version of high-class entertainment. “Stop playing Beethoven!” Schultz screams, no longer able to stomach the desecration. In doing so, he has violated his own rule and broken character. Or, to put it another way, he has evolved as a character, which is something you can’t say of Django himself. Over the course of the action, Schultz deepens in his commitments—to what he sees as right, and to the partner he hadn’t expected to find—eventually deciding to gamble more than he’d ever bargained for. And how does Django evolve? He changes clothes. Although Foxx does everything he can to ground Django emotionally (and succeeds), he’s playing a man who always wants just one thing, and who practices one steady method—violent self-control—in trying to get it. Such singleness of purpose may arguably be realistic, but it flattens Act IV of Django Unchained. Part of Tarantino’s achievement is to make nonformulaic films out of movie formulas. 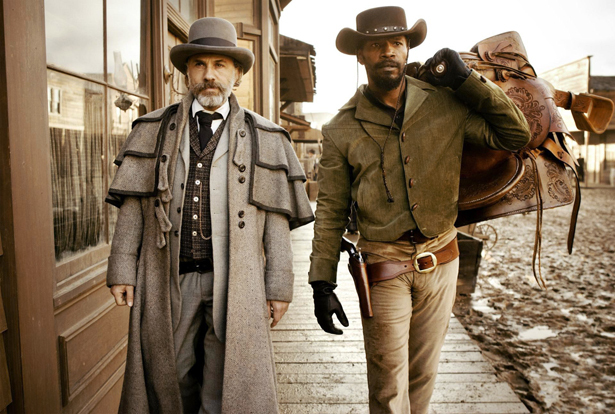 The climax of Django Unchained, at once bang-up and a letdown, was the moment when I wondered what had interested Tarantino more: the feelings of a black man fighting his way out of slavery, or the possibility of repurposing Christoph Waltz from Inglourious Basterds. To think that Waltz may have been more important, and that Tarantino couldn’t truly dig his way into Foxx’s character, is to betray a suspicion that the movie as a whole is an exercise in White Negroism. Having raised that doubt, I now say: let it hang. A charge of inauthenticity was the risk Tarantino took in playing the game of Django Unchained. To judge from the payoff coming from the screen, he’s won the bet. Back in 2009, Stuart Klawans opted “to have no opinion about” Quentin Tarantino’s Inglourious Basterds, asserting that “indifference is the only unforced response left to me.” See why.